@Jane-Holly Meissner thanks for the heads up; I’ve noticed some oddities too. Will investigate. Great! Also patching up the little like bug too. @Jane-Holly Meissner thanks for bringing this to my attention. I accidentally switched the default feed to people you are following. I’m working on switching back so it will be how it was before. 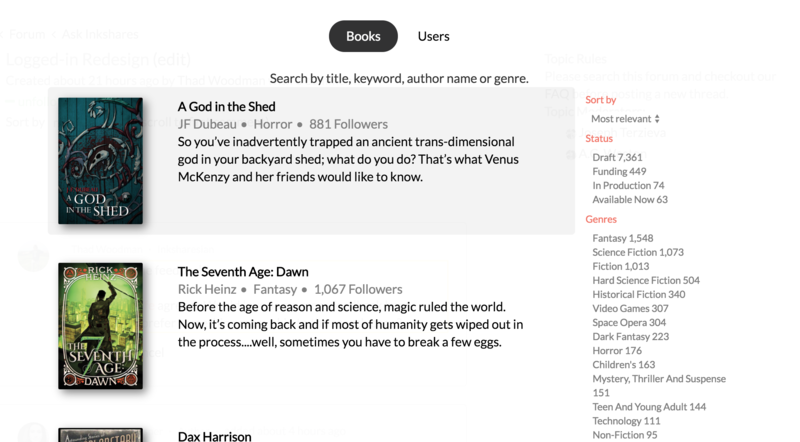 The new Reader Activity feed is not as good as it used to be. I liked actually seeing everything people were liking and recommending - switching to a curated view (like Facebook and Instagram taking it upon themselves to show me just what they think I like, instead of just everything my friends post) has killed the feed for me. It doesn’t work, and I think it was much better in its previous incarnation. It looks like you can no longer access the contests when logged out. Is that right? Or am I missing something really obvious? Just realized in the mobile version there’s no link to the Syndicates page. Edit: and my Syndicates don’t show up in my profile drop down menu anymore, either. Also, it might just be because my monitor is larger than average, but I see quite a bit of just empty space. Especially on the toolbar to the left; the buttons are much larger than the text on them really requires. I like the features and layout, but the overall aesthetic look of the home page seems kind of antiseptic now. No colors, no pictures, just words and toolbars. I imagine that’s partly because of the modular approach and will change as you add the new features you mentioned, but right now it just looks very sterile. I still cannot get past the spinning circles to the site. I’ve sent a screen shot of the problem and the URL. Still no answer. Can the search bar be made larger and more obvious? I’ve talked to people about finding my book The Burned and they often ask where to go to search for it. Some have said that nothing comes up. @Thad Woodman Yes definitely! That sort of digest for each book allows me to know what they are about without having to click, and website visitors hate clicks. Quick question: Is there a reason that the website starts with the reader activity as the first thing a visitor sees and not the books themselves? I always thought it would be cool to have at least a smattering of featured books (maybe like the top three Staff Picks, or things currently on sale, or in a contest maybe) right at the top of the index. Now that I see your new concept for a book entry, I think it would be perfect to lure readers into the ecosystem to feature the books up front and personal. seems like I get the spin every time I sign in....never get past it to readers activity. @Billy O’Keefe agreed. Would love some more feedback here. Would folks prefer something more akin to the search page? In the mobile version the menu on the bottom covers up the links at the bottom of the site. Is there a way to add an option to "see full site" on the mobile site so one can see it either way if they want? Or is there one there already and I’m blind? I love being able to access the forums without scrolling to the bottom of the page. Can you add a link to the company blog on the sidebar as well? @Billy O’Keefe , My gut says they are doing something like that pretty soon. They just started revamping the book genres, which is the first step in displaying the books differently. I see this new page layout as the initial steps to some of the site requests we’ve been asking for. Love the new menu sidebar. Looks nice and functions well. But one thing I’d still rather see (in the discovery areas) is books laid out in rows and columns instead of just rows. The current holiday sale page, for instance, is one long row, and I think it’d be easier to scroll through all the books for sale if they were arranged more as a grid that flows down the page. This is especially the case on smaller screens. I know that’s trickier on the main discovery page, since there’s categories to consider, but just something that’s stood out to me for a while. As you may have noticed we just deployed a pretty significant change to the homepage for logged in users. Our aim is to provide a cleaner, more cohesive experience which serves as the foundation for some great new features we’re rolling out in the coming weeks. Please let me know if you have any suggestions or tweaks you’d like to see.